Learner engagement – It’s an ACCME mandate and the defining characteristic of every successful CME program. It is also notoriously difficult to develop and sustain. In this post, we will offer several medical education management tips to consistently keep learners engaged. The CME vision contained in your program’s original mission statement will undoubtedly change over time. Your expectations will evolve as the educational needs of your learners become more diverse—and, in many cases, more challenging to fulfill. What won’t change is the need for an accurate assessment of your learners’ competence gaps and your organization’s ability to successfully address them. A high level of engagement lends to better knowledge retention on the part of the learner and, ultimately, improved professional performance and patient outcomes. This means that the degree to which students are engaged with their courses will determine whether your program meets its objectives. Is there evidence that knowledge retention significantly improves as more activities are completed? If this is not the case, and there are no or relatively few learners showing stellar progress at the end of a course, this is a good indicator the design of your curriculum is failing to engage. That means your CME program at present will have minimal impact on the professional practice gaps your association aims to address. If your LMS platform doesn’t allow you to easily update course content when improvements are needed, then your users learning experiences will remain less than optimal until changes are made. Do your courses have healthy completion rates? If your program has several courses in which high numbers of learners abandon activities and don’t return—especially if they are doing relatively well—this could suggest there is a problem with the LMS itself. Whether the issue is a challenging LMS navigational structure or that human error (such as accidentally logging out) creates a chain of frustrations for users, an LMS that is not user-friendly is an unnecessary roadblock for learners. Are learners responsive to email reminders and communications? When important reminders are missed, a domino effect may ensue: course completion deadlines are missed, payments are not processed on time, and support tickets begin to mount. When active LMS users fail to respond, it may be the message, rather than the recipient, causing the communication breakdown. Common reasons for messaging fails are poor scheduling (very early morning or late night arrivals), spam-worthy subject lines (“Hiya Bob!”) and lengthy introductions which bury the purpose of your message (“You mean so much to us! Our learners are the wind beneath our wings…We will stand by you in your journey…please remit your payment within two business days.”). Once you’ve answered these questions, you should revisit the original expectations for your CME program’s educational impact which were listed in your association’s mission statement. You may find that your ability to keep learners engaged is hindered by one or more of the issues we cited above. If this is the case, you will need to resolve these problems before you attempt to move forward. An enterprise-grade CME platform will handle the moving parts of your engagement strategy—from optimizing LMS content design and website management to maintaining learner outcome analytics to automated email scheduling—from a single dashboard. If you are flying solo, then you’ll need to be certain that you monitor the above data closely week-by-week as you work on improving user experience. Use animation sparingly in activities and only when it is the most efficient way of getting a point across. Make videos succinct and easy to understand. Use static visuals (such as illustrations and text) in your videos to reinforce topics being discussed. Make sure that webinars or live streams are professionally produced and easy to follow. Be sure to make transcripts available after broadcast. 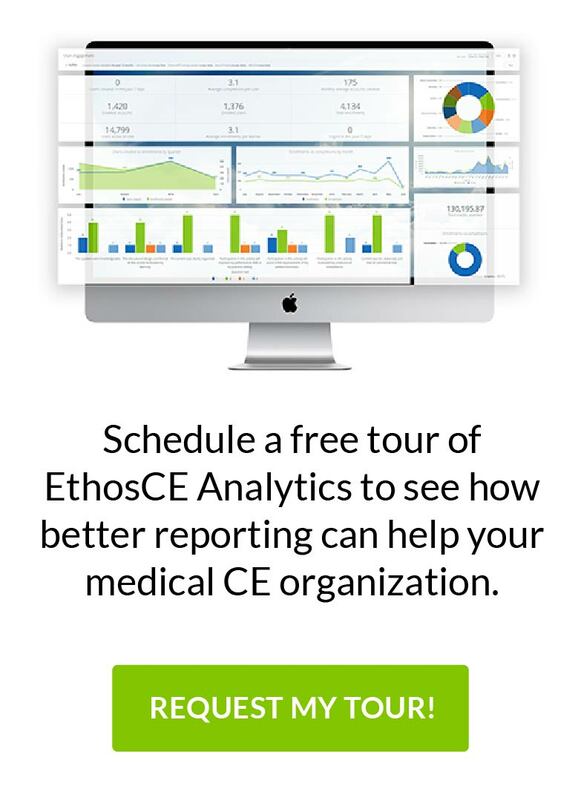 If you use a CME management platform such as EthosCE, your LMS will have full multimedia capabilities as a course feature. If your LMS does not allow you to use rich media, then you may face a challenge in using the above components with your courses. In short, this is what your engagement strategy is all about: streamlining the management of your CME program so that the focus returns to creating superior educational experiences. To do so, your LMS should provide numerous options for course development, allowing for self-paced courses and easy integration of rich media, while making resource-intensive tasks (such as data collection and PARS-compliant report generation) virtually effortless. Above all, course features should be advanced, comprehensive, and work “out of the box”. For more than 16 years we at EthosCE have helped associations of every size provide exceptional learning experiences for their members. Our LMS is user-friendly and designed to make activities enjoyable, absorbing, and impactful. If you’re ready to jumpstart your learner engagement strategy, schedule a 1-on-1 with us right now to speak more.